The Sony CUH-ZCT1E Dualshock 4 Wireless Jet Black Controller is the perfect accessory for enhancing your Playstation experience. The wireless feature of the dualshock 4 enables you to sit where you like in comfort without worrying about pulling or tangling wires. 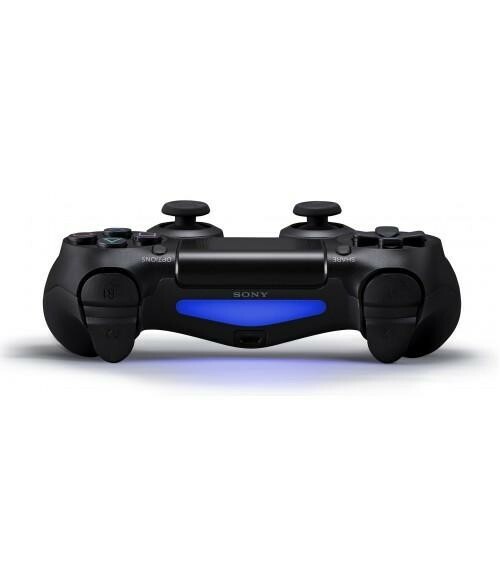 The design and sensitivity on the analog sticks and trigger buttons on the dualshock 4 ensure that you have complete control while gaming on the Playstation 4 and the six-axis sensor lets you control your gaming by simply moving your controller without pressing any buttons. The innovative touchpad is a great feature on the dualshock 4 and the new share button lets you instantly capture you gameplay and share it with your friends and family. Other great features on the controller include a built in speaker and a light bar which uses different colours to enhance your gameplay. The controller can be charged up by simply plugging it into your console with a micro USB cable and the 3.5mm audio jack lets you plug in your headset and play quietly without disrupting other people and communicate with other gamers.